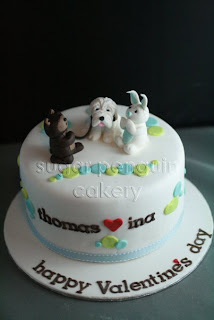 This cake was a special request for Valentine's Day from a gentleman who liked to create a cake for his wife who is a new Mother! He wanted something sweet for his wife and his newborn baby. 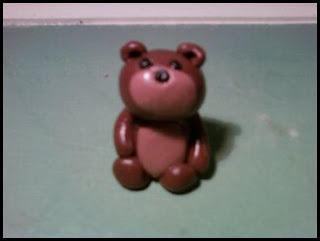 We came up with a Mommy bear holding her little bear cub, made out of sugarpaste/gumpaste. Designing this cake came so naturally for me, since I had my baby, two years ago. Motherhood was the most rewarding thing I have ever experienced in my life. I would not lie that it is a lot of work, with an occasional frustration in between, but I have to say, I have never experienced love like this before. You know it's that time of the year when the cute and cuddly bears go marching in... specially when all them have a red heart on their hands... It's Valentine's Day! 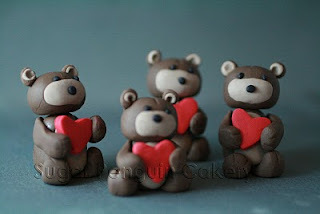 Love was definitely in the air during the creation of these bears. It filled our small workshop. We can't help but to smile as all of them looking so sweet as they carry that little red hearts on their hands. We were very much overwhelmed with people's responses since we launched our venture. We humbly thank you all for the orders and the responses. 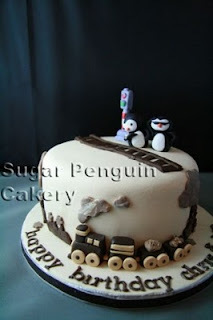 Welcome to SUGAR PENGUIN CAKERY! Ivone and I mulled over this name so many times, even pretending to call each other and greeting "the caller" with different company names to make sure that everything felt right. 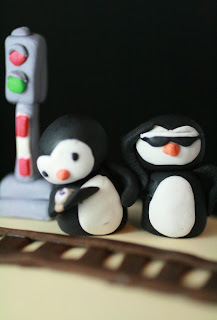 We specialize in fondant art so hence the SWEET - ness in our name. The penguin is the one character that just makes us laugh and laugh and laugh because it's so silly, adorable, yet endearing all at the same time. Cakery...it was the last touch that we needed to our name. 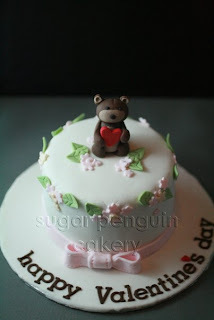 There are a millions things we need to do and for those who care about our project - we want to share with you our ideas, our journey through starting a small local business, the trials, the joys, THE CAKES, new characters, our new creations, and anything and everything that has to do with Sugar Penguin Cakery! Bonnae wrote: My first offiicial bear! It was not easy and I have a new found respect for the art that Ivone creates. It took me all night to do 3 bears while watching The Bachelor, Jake, find love amongst 5 bachelorettes. (Ali should win!!!) As her partner, I wanted to practice at home so I can assist Ivone when we're putting together our orders. I love him!